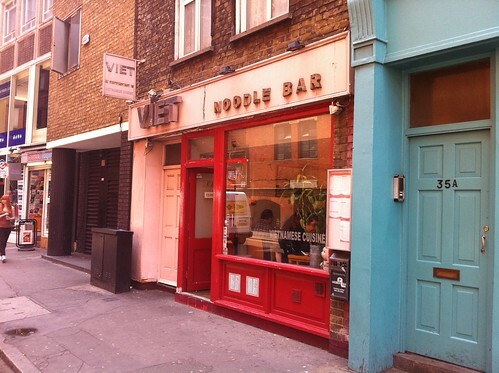 a rather unusual chinaman: Viet Noodle Bar: No fuss, max flavour. 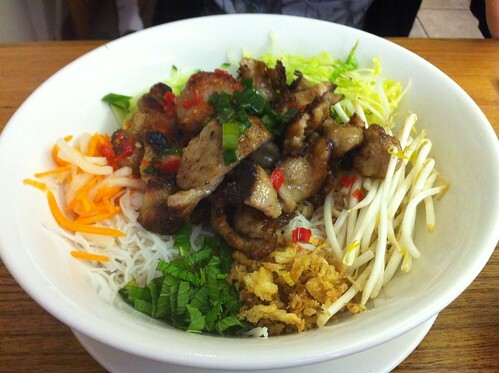 Viet Noodle Bar: No fuss, max flavour. I was a little disappointed by a visit to Pollen Street Social recently. Whilst the food was ok, the service was disappointing in parts and if you take into consideration the whole "effort" it took to go there (taking into consideration the time to get the booking, the rounding up of dining partners, coordinating diaries, saving up enough cash so you can pay the rent at the end of the month, making sure you are suitably attired etc...), I sadly don't think the personal "investment" was really worth it. Which brings me to Viet Noodle Bar. Here I was, strolling the streets of Soho with Cat, looking for a bite to eat. She's leaving the country soon you see, so any time I can fit in with her the better. Almost by accident, we walk into Viet, a favourite of Cat's, and somewhere I have never been before. No booking, no required "smart casual" attire, just a room full of people looking to fill their bellies with Vietnamese food. 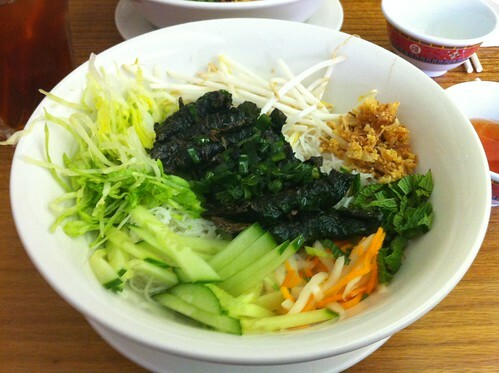 The menu itself is full of Vietnamese favourites, but not so large that it gets confusing. As much as I love pho, it was a warm day and definitely not the weather for it, and I was assured that the bun was very good. With Cat opting for the bun hit nuong (chargrilled pork with rice vermicelli and salad), I went for the bun bo la lot, the same as Cat's, just with beef wrapped in betel leaves instead of the pork. As a waiter carried a steaming hot bowl of pho past me, I had an "aaah bisto!" moment as I inhaled the heady herbal aroma. I almost regretted not sticking for my regular choice but was thankfully not let down. Once dousing everything in my bowl with the chilli laced fish sauce, all the composite ingredients eaten together combined to form an exciting lunch bursting with different flavours and texture. First a big mouthful of vermicelli noodles, mopping up the fish sauce, strands of chopped salad adding bite and keeping it fresh, pickled carrots and radish delivering a sharp zing to liven up the tastebuds, only then to crunch on some deep fried onions flooding your mouth with sweetness. The beef itself was delicately wrapped in the leaves like little beefy spring rolls, and each bite was savoury and meaty. Cat's pork was equally delicious, with generous hunks of pork cooked in a sweet soy glaze. I was really impressed with what I had eaten. I had entered with no booking and no expectations. With a cold iced tea to keep me lubricated and a mere £8 poorer later, I was as pleased about a meal as I had been in quite a long while. Viet serves great, honest Vietnamese food with no airs and no graces. I'll definitely be back for that pho. ooh - it looks like they've snazzied up the frontage of it. Last time I went (admittedly a couple of years ago) it wasn't as polished. I seem to remember their banh xeo is great; and BYOB! I like Viet. It's my go-to place when I fancy some decent pho in Soho. We need more places like this in the area! The viet restaurants are taking over Soho, I must add this one to the list. Love this place. Not sure why I haven't been in ages though... I must go soon! @ Lizzie - The insides are definitely not snazzy! @ Jia - I actually think Soho is doing pretty well for Vietnamese food. I know it's not everyone's favourite, but I am really liking Cay Tre too. @ Su-Lin - Do it!